Welcome to the start of my Michigan brews mini-series. I was in the western part of the state last weekend (right on the edge of Lake Michigan) and threw together a build-your-own 4-pack of offerings from a handful of the state's breweries. Some of them, like Atwater (the brewer of today's beverage) I know and love. Others I had never before encountered. However, while I've never had these specific offerings from the breweries I've selected, none of the styles of beer I'll be discussing in the series are foreign to me. Since I pieced the 4-pack together myself, the only descriptions I have of the individual brews are the ones listed on each beer's bottle/can. Until I research the brew its maker's website, that is. 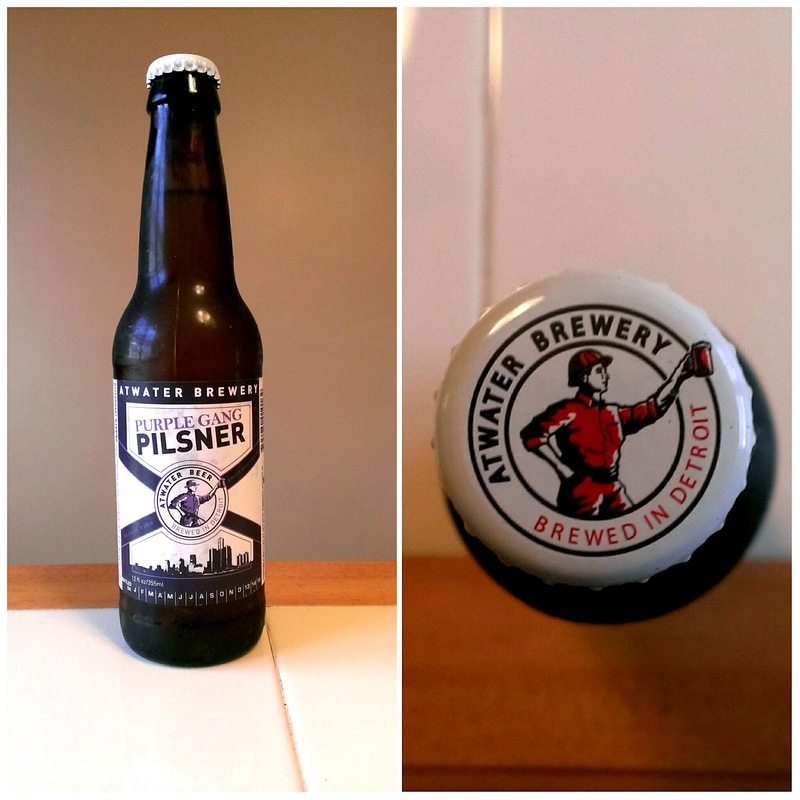 Today I am, obviously, talking about Atwater Brewery's Purple Gang Pilsner. As mentioned, I've had Atwater before. The brewery's Vanilla Java Porter is a favorite beer of mine. It's the perfect ending to a long, sultry summer day. The killer slogan of Atwater Brewery, which was founded in Detroit in 1997, is "We drink all we can and sell the rest." The brewery employs tons of German influence and techniques--all their equipment comes from Germany, as do all their hops and malts (except when it comes to their speciality ales, for which they use US-grown hops). The website indicates that Purple Gang Pilsner is a year-round brew. I assume this means that it's not one of Atwater's specialities and is, therefore, very German. I also assume that means you can call their distributer in your state to discover where you can find it. Now, as far as the beer itself is concerned, a name like Purple Gang Pilsner makes me think it would have a hint of grape flavoring. My nose isn't picking up on any of that. It smells like a pilsner. Which is good, I like pilsners. 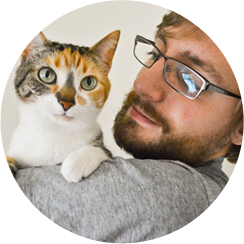 Maybe the lack of a fruity scent is attractive to Purrl because she really seemed to like this one. 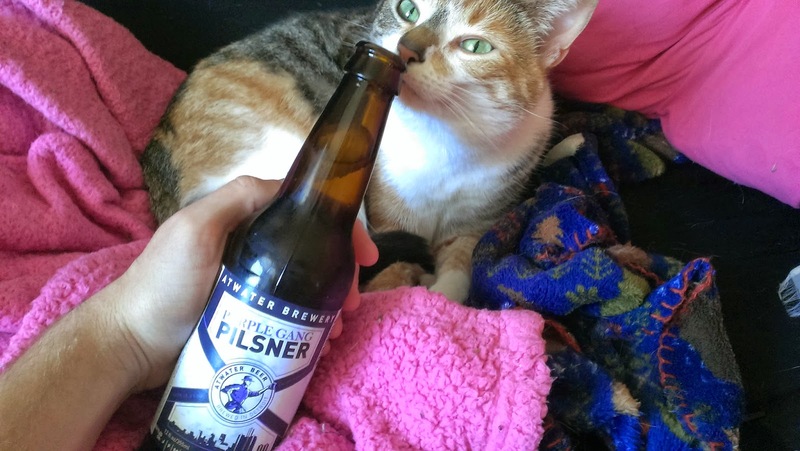 She gave the pilsner a total of eight sniffs. It looks like she and I both agree on the quality of this beer. There's no grapeiness in the beer's taste. Nothing out of the ordinary here. It's a pilsner and it tastes like one. Let me take that back. It tastes like a pilsner from a brewer that knows what a good pilsner should taste like. That is to say, it tastes like a good pilsner. The beer doesn't have any special mouthfeel. It's smooth and goes down easy. Last summer I spent some lazy weeks in Athens, Ohio while studying for my masters comprehensive examinations. I would lounge on my tiny porch--it was actually more of a half-stoop--in the sun, a book in one hand and an good beer in the other. Warm weather makes me want an uncomplicated brew that goes down easy so that's what I would spend my study hours swigging. I lived on a quiet little street with trees covering the southern half of it. At times, the wind would blow through those trees and stir up their leaves. That's what this beer evokes in my mind; the noise of leaves in the wind (not prohibition. Sorry, Atwater). It was inexplicably relaxing. Atwater Brewery's slogan essentially means that they brew beer they want to drink. I find that admirable, and I understand why Purple Gang Pilsner is a beer they'd want to drink because it's a damn good beer. It's a brew that knows exactly what it is and isn't fussy about unnecessary ingredients. 9.0/10 is what I'm giving it. Look into picking it up if you like a good, simple pilsner. It's something that's sure to be a staple of my beer purchases in 2015's warmer months.